Book #21 in the multiple New York Times best-selling Ring of Fire series. The uptimers and their allies take on the Ottoman Empire at its height of power. The modern West Virginia town of Grantville has been displaced in time to continental Europe in 1632. Now four years have passed. The long-feared attack on Austria by the Ottoman Empire has begun. Armed with new weapons inspired by the time-displaced Americans of Grantville, the Turks are determined to do what they were unable to do in the universe the Americans came from: capture Vienna. The Ottomans have the advantage of being able to study the failings and errors of their own campaigns in a future they can now avoid. They are led by the young, dynamic, and ruthless Murad IV, the most capable emperor the Ottomans have produced in a century. They are equipped with weapons that would have seemed fantastical to the Turks of that other universe: airships, breech-loading rifles, rockets—even primitive tanks. And this time they won’t have to face massive reinforcements from Austria’s allies. The emperors of the United States of Europe and Austria share the same problem. They have one too many enemies, one too few allies, and only one general to cover the gaps. In fact, the only force Emperor Gustav Adolf can think of sending to Austria is the USE's Third Division. Fortunately, their general is Mike Stearns. And what this uptime labor organizer sets out to do gets done. Eric Flint is a modern master of alternate history fiction, with over three million books in print. He’s the author/creator of the multiple New York Times best-selling Ring of Fire series starting with first novel 1632. With David Drake he has written six popular novels in the “Belisarius” alternate Roman history series, and with David Weber collaborated on 1633 and 1634: The Baltic War and latest Honorverse series entry Cauldron of Ghosts. 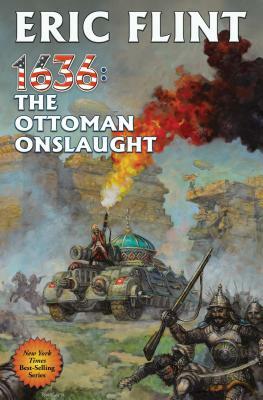 Flint's latest Ring of Fire novel is 1636: The Ottoman Onslaught. Flint was for many years a labor union activist. He lives near Chicago, Illinois.